The Australian Chamber is concerned that the ABN registry will be used as a tool to encourage compliance with tax obligations, particularly if poor tax compliance is used as a reason to cancel an ABN. The ABN system is a registry first and foremost, used as an identifier of businesses. There are other substantial enforcement provisions that can be used to ensure businesses comply with their statutory obligations. 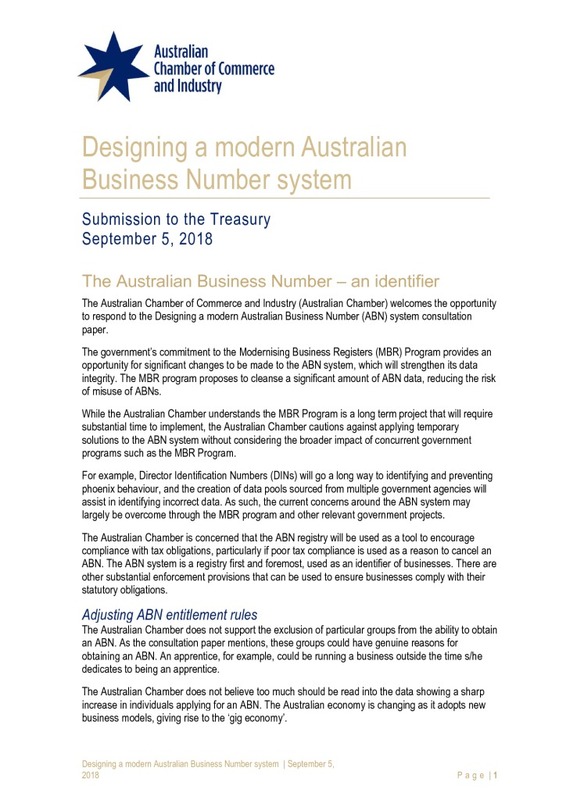 The government’s commitment to the Modernising Business Registers (MBR) Program provides an opportunity for significant changes to be made to the ABN system, which will strengthen its data integrity. The MBR program proposes to cleanse a significant amount of ABN data, reducing the risk of misuse of ABNs. The Australian Chamber cautions against applying temporary solutions to the ABN system without considering the broader impact of concurrent government programs such as the MBR Program.